Powers/Abilities: The wearer of the Mask is, to all intents and purposes, invulnerable. Injuries of any sort do no permanent damage, no matter how severe. Although they do bleed normally, the wearer feels no pain (the movie translated this into making the wearer a living cartoon character). They can also produce any weapon they desire out of thin air (again, in the movie this became any prop, a la Bugs Bunny). These are as lethal to normal people as real weapons would be. Since the wearer of the Mask has their inhibitions and conscience removed, treating others as if they were invulnerable as he is, this tends to mean that the Mask kills those he encounters. 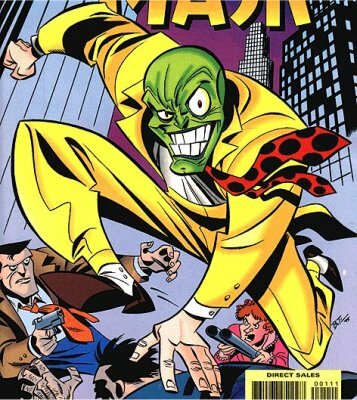 History: The Mask is a mystic artifact capable of transforming the wearer into a psychotic living cartoon. Created in Africa, it was stolen and brought to the United States for sale. The first recorded wearer in modern times was the neurotic Stanley Ipkiss, who found it lying in an antiques shop, and bought it as a present for his girlfriend Kathy. However the Mask is able to sense evil in a person's heart, and called out to Stanley, causing him to try it on. After going on a murderous rampage where he took vengeance on everybody who had ever upset him (during which time the media dubbed him Big-Head), Stanley managed to get the Mask off. However it swiftly took control of his girlfriend Kathy, who promptly shot and killed Stanley. Kathy managed to remove the Mask, and gave it to cop Lt. Kellaway for safe-keeping. In spite of her warnings, he tried it on as a joke and thus he too fell to the lure of the magic. He became an insane vigilante, taking on the nearly invulnerable mob killer Walter among others. 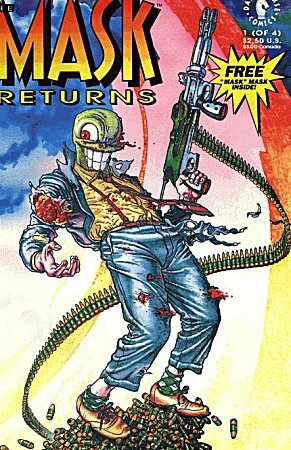 Driven mad by the Mask, it was only a close call when he nearly killed a friend who got in his way that convinced him to give up wearing it. He buried it in his basement. However the mobsters he had attacked tracked him down, and Kellaway tried to chip the Mask free off the cement floor. Kellaway was wounded, and the Mask took possession of a geeky mob driver, who swiftly took over the entire local underworld. However Kathy tracked him down, and tricked him into removing the Mask, at which point she killed him. Walter had gotten out of prison by this point, and a final battle between the mobster and Kathy/Mask saw the loss of the artifact and the apparent death of Walter. Inevitably the Mask was discovered again, this time by four high school kids who passed it around between them. However Walter had returned too, seeking vengeance. It then fell into the possession of an embittered comic book artist whose wife had been killed by the mob, before falling through the dimensions, ending up coming out the Vortex into Comic's Greatest World. The next wearer used it to hunt for his missing sister in New Orleans, and subsequently it ended up in the hands of the Batman's nemesis, the Joker. Since then the Mask has continued to move from wearer to wearer, leaving chaos and destruction in it's wake. Comments: There seems to be some confusion about who actually created the Mask, with two different opinions being espoused - one says it was Dark Horse founders Randy Stradley and Mike Richardson, another says John Arcudi and Doug Mahnke. I think the former thought up the character, but left the actual scripting and art chores to the latter, but if someone out there can confirm the truth or otherwise of this, please get in touch. 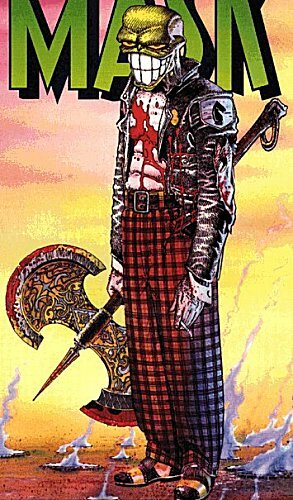 Prior to the arrival of the current Mask, the prototype for the character appeared in Dark Horse Presents #10, under the slightly different spelling, The Masque. As correspondant Justin Anderson points out "There have effectively been 2 Masks. The movie/cartoon version, and the original comic. The movie was based loosely on the comic." Lt. Kellaway is in the movie too, given the first name Mitch (his name is never given in the comics). 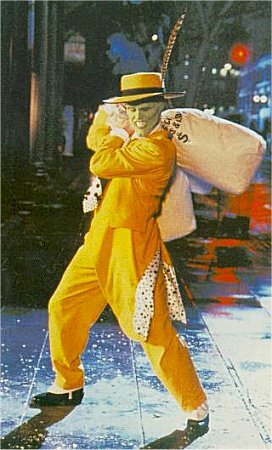 The last two wearers of the Mask were an unnamed pickpocket (who wore a yellow suit akin to the movie), and DC Comics anti-hero Lobo, both featured in the crossover Lobo/Mask story. 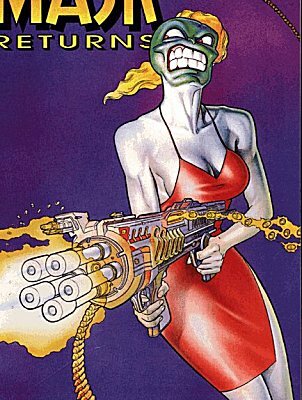 Lobo, while wearing the mask, slaughtered a few galaxies. But due to time travel, the events never happened and he sold his past self out for the bounty on the "Ultimate Bastich". Thanks to Justin for all of this, and most of the history above. How Much Is That Dog in the Tin Can?